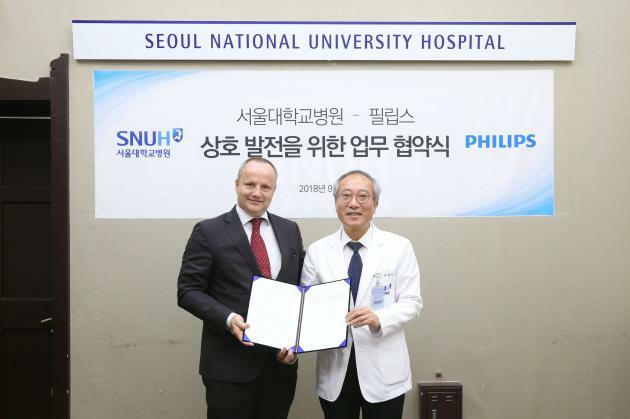 Seoul National University Hospital (SNUH) said Tuesday that it has concluded a business agreement to develop an advanced medical care model with Philips. SNUH President &amp; CEO Suh Chang-suk (right) and Philips General Manager of Health Systems ASEAN Pacific Diederik Zeven hold up their agreement, at Seoul National University Hospital in Yeongeon-dong, Seoul, on Wednesday. The hospital explained the intention to cooperate with Philips is to secure a world-class advanced medical care model and provide the best medical service that matches domestic situations. In line with the Fourth Industrial Revolution, which is encouraging national IT development, SNUH expects that its collaboration with Philips and its broad portfolio of connected care, and health informatics solutions and technology will bring optimal results. The two organizations will form a working committee and seek ways to develop the best medical care model. The committee will discuss and refine various agendas, such as improving patient safety in general wards, which are considered to be blind spots in safety management, establishing ICU management solutions tailored to Korean conditions, and developing joint projects in other IT healthcare fields. The two institutions are discussing their plan for patient safety improvement. As the severity of the patients in the general ward increases, the patient safety aspect of the third-class hospital certification standard has also intensified. As a result, both organizations will seek out solutions that can identify and actively cope with patient conditions in general wards. “We plan to receive various overseas cases and know-hows that Philips have, and plan to discuss ways to apply it to our medical environment,” SNUH President & CEO Suh Chang-suk said. “The cooperation will not only increase the level of medical care at the hospital but also provide a path for the development of a new medical system and help lead the medical advancement. Philips was also enthusiastic about the cooperation agreement. "We are delighted to have a partnership with Seoul National University Hospital, which has one of the world's best education, research and medical environments,” Philips General Manager of Health Systems ASEAN Pacific Diederik Zeven said. As a leading healthcare technology company, Philips will provide healthcare capabilities and relevant innovations such as connected care and digital solutions that it has accumulated for over 100 years, he added.